The Zambia police in Mongu have been keeping two retainers for the BRE recognized Chief (Mwene) Chiengele (Mr Kanshengula) for two weeks now in custody on trumped up charges. The two retainers, Mr Sibale Liywali and Mr Chinyama Kayovwe were arrested following a report of aggravated robbery against them by the dethroned former Chief Mwene Chiengele, Josiah Mubukwanu Litiya Nyumbu. The National Prosecutions Authority is however not willing to take the matter to court due to lack of evidence against the two but the police has continued their detention without trial. The two chiefs’ retainers were arrested by Mongu Criminal Investigations Officer , a Mr Machavu who is believed to have received money from Josiah Nyumbu to ensure that the two are locked up to punish the new chief Chiengele who was installed by the Barotse Royal Establishment (BRE) as per guideline following Nyumbu’s removal from the position due to corruption. In October of 2014, the Barotse Royal Establishment (BRE) had dethroned Josiah Mubukwanu Litiya Nyumbu as chief (Mwene) Chiengele of the Mbunda people of Mongu after he refused to appear before the BRE Kuta (royal court) to answer charges of illegal land distribution brought before the Kuta by his subjects. He had further claimed that the BRE had no power to dethrone him, arguing that he could only be dethroned by the president of Zambia. Following his dethronement by the BRE, President Lungu withdrew his recognition as chief of the Lozi Mbunda people of Mongu district following a recommendation from the Litunga and this was communicated in a letter dated 5th June 2015. 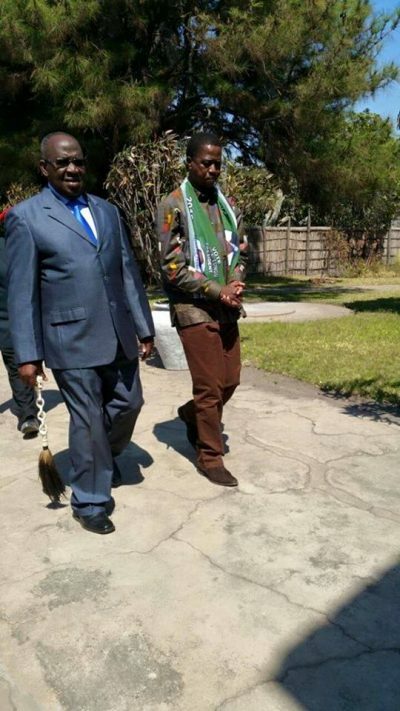 All chiefs in Barotseland are enthroned through the Barotse Royal Establishment (BRE) after fulfilling all requirements after which the Litunga recommends them to the Zambian President. The Zambian government has however made amendments to the constitution on the part of recognition and dethronement of chiefs aimed at weakening the Litunga’s powers and causing division in Barotseland. Josiah Nyumbu was installed as chief (Mwene) Chiengele by the BRE in 2010 at Limulunga Royal Village to represent the Mbunda Lozi people of Mongu.